It’s crazy to think that the month of September is already over. For those of you who may not know, September tends to be the craziest month for us wedding and elopement photographers. Here at Sheena Shahangian Photography, we haven’t really had much time to sleep, let alone post to social media or even update y’all on what we’ve been working on. But, good things have been happening! A little over a month ago, we were published again in Rocky Mountain Bride, one of our favorite local wedding blogs. This was by far one of our favorite shoots to have been a part of, and we are so thankful for the team of vendors that made this possible. 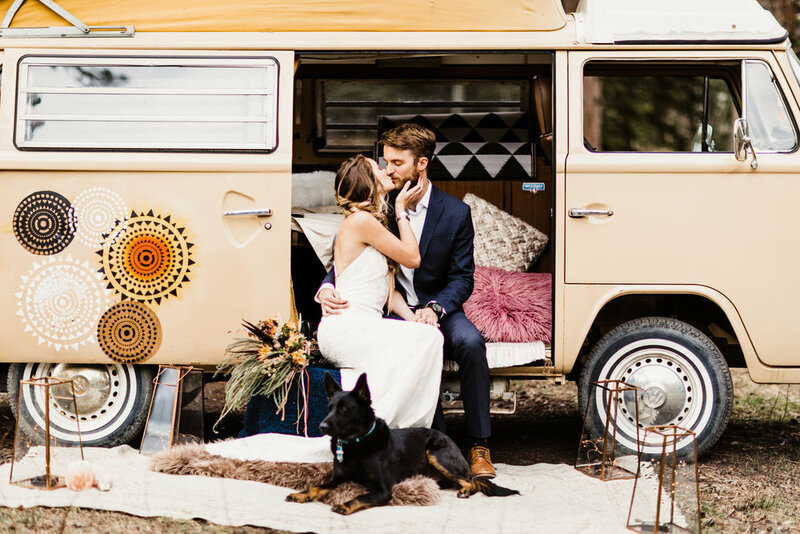 All of us came together to plan and design a camper van elopement inspiration shoot, in hopes to inspire today’s brides to embrace the non-traditional on their wedding day. The shoot is full of camp vibes and lots of mountain love (and the sweetest puppy you’ve ever seen). Honestly, it’s the perfect inspiration for the boho bride looking to elope in the Colorado Rockies. Y’all can check out the full article here. And if you’re interested in planning your own mountain elopement, that’s our specialty. As elopement and intimate wedding photographers, we pride ourselves on not just documenting your elopement, but helping you plan out all the little details as well. Give us a shout. Something tells me we could create sparks together.